Asus G 751 JY vs. msi gt72 dominator pro. Hi everybody welcome to comparison battle between Asus G 751 JY n msi gt72. 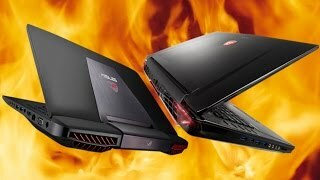 A Dominator pro in this video will present all features and specifications of these two fantastic laptops and we will try to present them in the most balanced and then throw away as possible we are not siding with any of these companies but many of you have questions and we will try to answer them with all our informations if you find this information useful and helpful please show some appreciation and support to our channel and now get ready for the ultimate laptop comparison content of this video is as follow CPU RAM storage. Display GPU team performance cooling. Temperatures sound design and materials. Price optical drive networking upgrade. CPU central processor unit is a brain of all operations in computers and one of the most important parts of your laptop Asus comes with intel core i7 47:10 HQ up to 3.5 gigahertz or Intel Core i7 4860 HQ up to 3.6 gig art msi comes with. Intel Core i7 47:10 HQ until 3.5 gigahertz or i7 4980 HQ up to 4.0 gig. Arts let's speak about the CPUs 47:10 HQ has integrated HD graphics 4600 GPU dual. Channel ddr3 memory controller max memory size as they do gigs around supported thermal design power by 47 watts max a lower temperature is 100 degrees price around $378 48 60 HQ is. Equipped with Intel iris pro GPU 5200 price around four hundred thirty four dollars forty nine eighty HQ is also equipped with Intel iris pro GPU 5200 price it's expensive around $623 pick out the benchmark results in Pathmark. For example Intel Core i7 a forty nine forty MX v 3 point 1 gigahertz core 9800 49 and prizes around one thousand ninety six dollars forty seventh and HQ offers great performance but if you can afford it definitely recommend to go with higher CPU in both models Asus higher CPU version is cheaper but MSI gives more performance price versus performance your choice wrong both models comes with a choice of rum 8 16 24 or highest 32 geeks ddr3l 1600 megahertz rum can be easily upgraded in both models if you don't go before max 32 gig version price of a tweak single round model is between 70 to 150 dollars depends on the brand and quality legal information from me for simple modern gaming and applications you are good to go with 16 gigs of ram both models are equal in the section a random access memory storage storage is another easily upgradeable part of your laptop and most vulnerable there is plenty of options in both models but let's outlook on the smallest medium and high storage options consider it as for more advanced storage parts your model will cost much more in overall price asus has two slots for storage you can choose endpoint to SSD mSATA in primary up to 512 geeks endpoint to SSD in one slot or normal HDD or SATA free SSD up to one terabyte each smallest and cheapest option for storage is one terabyte HDD at 5400 rpm he breed with. Eight gigs SSD medium option is 256 gigs. Of endpoint to SSD plus finally 12 SATA 3 SSD top option is 2 times 1 terabyte a raid 0 SATA 3 SSD into slots around $700 each msi supports up to 4 times 8.2 SSDs. Together in a 4 endpoint to SSD slot each slot can be upgraded up to 512 gigs endpoint to SSD together around 2 terabytes endpoint to SSD storage in one storage slot for second storage slot you can choose between HDD or SATA free SSD up to one terabyte each smallest and cheapest option for storage is stock 128 gig solid state drive endpoint two-in-one mSATA slot +1 terre by HD 7200 are Media option is 2 times 256 gigs in to endpoint to SSD slots plus 512 SATA free SSD top option is 4 times 512 geeks in 48.2 SSD slots plus 1 0 by SATA 3 SSD you pay around $1500 for 4 times 0.2 SSD. To be found to 12 gigs SSD plus 7 dollars for it 1 terabyte SSD for storage options if you have the money msi supports faster and higher capacity v feeds four times final 12 gigs and point to SSD plus secondary slot for storage tribe this makes it up winner in this category however speeds between endpoint to SSD mSATA and normal 2.5 inch SSD SATA free are almost the same display Asus comes with 70.3 inches full HD matte type anti-glare ultra bright IPS screen 9020 time Tarantino Ice in plane switching display it offers premium quality fantastic viewing angles accurate colors and might be slower for gaming and standard TN display 120 Hertz screen not confirmed yet like in Asus G 750 J H or JX msi comes. With 17.3 full HD map type and Ziggler ultra bright II and display 1920 x 1080 or optional in some models 17.3 inches mat type anti-glare IPS screen TM displays offers similar color quality like an IPS display can be achieved only by calibration slightly worst viewing angles and a has a shortest response time that's really good for gaming difference between these displays is not big do you prefer a better colors of IPS for a photography or a graphic design or faster display for gaming with not such good color quality choice is yours both displays have its advantages and disadvantages but overall difference is not that big so you are able to do a good gaming on both make sure you get welding for about which type of display you are buying from your seller group you both a laptops are CBI Nvidia GT 19 but Asus supports for geeks of vram and MSI a geeks of VRAM the same situation was in early 2014 when GTX and REM series were released Asus was also sheep with a GTX aatma 4 gigs veera instead of eight geeks I have a video about the difference between them to have a look but a significant difference can be felt if you want to work on external display eight gigs vram will be much more useful for this scenario MSI's nvidia geforce gtx 980m with eight gigs of VRAM GTA v can be replaced thanks to a mobile PCI Express model MX name 3.0 disadvantages is that the mobile MXM GPUs are very expensive around $1000 a gaming performance will be the same with these GPUs but if you are into video rendering 3d design or wanna plug in your laptop multiple external displays gtx 980 and with a geeks veera in msi it's a better option also possible future upgrade instead of replacing the whole unit it's a great advantage of msi in this case msi has slightly better GPU options on other side surprisingly aces a slightly higher GPU score in benchmarking softwares both GPUs for benchmarks the same cpu i7 4710 HQ GUI performance to buy a laptop like. These models you must be a graphic design and professional photographer or a gamer gamers are the biggest group of people who are choosing products like these two models gaming performance and mobility is for many of you the key for choosing these fantastic gaming laptops for gaming airports and all parts of your computer but the most important is the graphic art in this case in both models gtx 980m is a fantastic desktop replacement and offers performance similar to desktop nvidia gtx 780 up to in some cases 780 titan we created series of benchmarks on our edgy max channel about mobile GPUs you can choose from many GPUs comparisons v4 laptop or desktop cards click the links below if you are interested to watch some GPU gaming benchmark in modern PC games gaming performance in both laptops is very similar we are concentrating on games and frames under 30 frames game is a lagging and is unplayable 30 to 60 you have a very good results and if you go above 60 frames you are reaching more smoother gameplay in both laptops screen are 60 Hertz supported so one hunts can be set as one frame 68 screens in both laptops all of you to visually see only a 60 frames in both laptops even if your frames show higher number if you want to experience additionally more frames visible you need to plug to your gaming rig an external display with a higher refresh rate for example 120 or 144 hurt screen gtx 980m also supports external connection to a 4k displays many modern games are playable at 30 frames 4k resolution of course with lower settings gaming performance is almost the same CPU and RAM can add a few extra frames and faster storage provides faster loadings in your applications click links below to see gtx 980m in action with these games. Cooling to cool down all the heat produce from high-end components like we haven't bought models eating and management of temperatures is crucial and very important Asus duo cooperate sinks and independently rear vent duel fans gets heat away from you the CPU and GPU have their own dedicated funds free heat pipes silent cooling and of course legendary cooling as proved from previous Asus G models MSI has dual fan thermal cooling and cooling can be a bit louder on max load than Asus manual change of temperatures with cooler boost manual fan control is a great advantage as you can see the results in a 3d fire strike free mark sky diver 3d mark 11 and watch stocks on ultra settings overall temperatures are equal in both laptops MSI did improve their cooling from previous versions so laptop audio. In these machines it's nice and crispy but still is better through external speakers or headset that's where the magic is happening asus comes with sony master speakers max audio equaliser support with many sound presets integrated subwoofer bus i integrated amplifier for audio outputs msi comes with a dino do speakers integrated subwoofer integrated amplifier for audio subwoofer and headphone jack some blasters cinematic sound is very similar in both models also they both are able to give fantastic performance with external speakers headphones or headsets design and materials Asus so-called Estela fighter inspired aluminum chassis similar to previous G series first time it supports aluminium finish with ROG model a so this brow on it's ergonomically unload keyboards soft touch anti slip palm rest a new jy version we can see new macro keys for instance team access or gameplay recording macro Keys for direct Steve access in game recording and free user macro Keys responsive back with keyboardist type in red color large multi-touch touchpad is great for working without Mouse materials are brushed metal aluminium and rubberized month MSI's design comes from the spa's racing cars solid one body full aluminum chases with aluminum finish on the top cover for better protection it gives a premium look steel series programmable full-color back leads whiff of medical variations keyboard tactile fast action keys plus macro keys programmable color light around touchpad quick launch keys like power button switchable GPU manual cooler boost free button xsplit gamecaster live streaming your gameplay and keyboard SteelSeries skull preset MSI's designer offers some more customization and colors variations on the other side asus it's more simple simple or fancy your choice course. Depends on configuration and seller but mostly depends on you asus unloads configuration we can see ABI purchase for $1600 up to 2000 899. Prices are flexible and will always move so it's very hard to answer this section do a good research before you buy your product msi lover models can start from. $2,000 up to 3500 hide an upgrade through custom companies up to $4,000 depending on extra add-ons and accessories also optical drive. Both models optical drives can be replaced with optical bei hard drive caddy to insert additional extra 2.5 inch HDD or SSD of your choice networking aces from reviews and research connection is stable especially during online gameplay you won't have any problems with both network adapters this time asus it's equipped with info virus AC 7260 on the other side msi. Comes with villain and villain killer both models are equipped with a Bluetooth 4.0 upgrade asus upgrades are. Storage and run msi upgrades our GPU. Storage and RAM MSI also has a easier access to clean the parts from the dust MSI has bigger advantage with upgrades thanks to a GPU MXM 3.0 slots warzone. Slots asus on the left side Kensington security lock 2 x USB 3.0 ports blu-ray optical drive memory card reader upfront status indicator lights power battery HDD Wi-Fi and capslock indicators on the right side we have headphone jack microphone jack line in jack 2 x USB 3.0. Ports mini display and thunderbolt port HDMI out Ethernet VGA out AC adapter.